A stereo receiver is a tuner, pre-amplifier and power amplifier built on a common chassis. This simplifies the stereo system and eliminates the RCA cables otherwise required to connect a separate tuner to a pre-amp and the pre-amp to a power amp. (Cables and interconnects are a common source of problems in Hi-Fi music systems, especially inexpensive and poorly shielded cables.) Another receiver benefit is lower cost, as one chassis is considerably less expensive than three. The receiver has been called the cornerstone of a stereo music system. It has long been the most popular way to control a home music system and provide power for loudspeakers. Most manufacturers of home stereo components offer receivers and brands such as Marantz, Denon, Luxman, Yamaha, Harmon-Kardon, Sherwood, Onkyo, Pioneer, Sony and Rotel, to mention only a few, are well known. 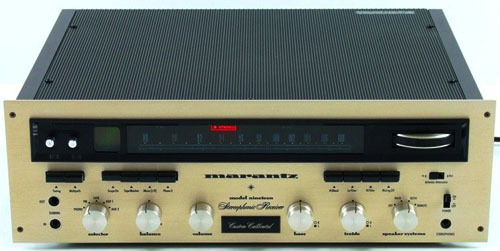 Perhaps the most famous, and possibly the best, receiver ever built was the Marantz Model 19, made in the USA. This instrument delivered an honest 50 watts RMS/channel (which was considerable at the time) and incorporated its own built-in oscilloscope. Its tuner, pre-amp and power amp sections were state of the art when it was introduced in 1970 and were comparable to contemporary separate components of similar power. Model 19's were individually calibrated and featured a gorgeous Marantz gold finish. They were practically works of art and weighed about 42 pounds. The original price was $1000, very high for a receiver in those days and within a couple of years, it had risen to $1200. (This would equate to at least $6000 in 2012.) However, even then, the top of the Marantz line were separate components. Responding to popular demand, McIntosh introduced a receiver in 1965, but called it the "MAC 1500," refusing to put the full "McIntosh" name on a receiver. The MSRP was $499. Interestingly, both the MAC 1500 and subsequent MAC 1700 were hybrid designs, using both transistors and tubes. The MAC 1900 of 1973 was their first entirely solid state receiver. McIntosh kept the MAC receiver line going through 1993, by which time the final model, the MAC 4300V, was selling for $2995. Despite their popularity, receivers have never been as highly regarded as separates by most audiophiles. Since a receiver combines a tuner and pre-amp, both of which process low amplitude signals, on the same chassis with a power amp that must deliver a high amplitude output, the latter can create electrical interference that degrades the performance of the former. It requires advanced circuit design, careful layout and comprehensive shielding to minimize these effects. Unfortunately, these refinements are not usually hallmarks of lower priced components. Receivers tend to have busy front panels and cluttered back panels. The front panel must have all the controls necessary to operate both a tuner and a pre-amp (usually including a headphone jack). On the back panel you will usually find inputs and outputs for the pre-amp and power amp sections; input jacks for a CD player, tape deck (in and out), turntable and auxiliary devices; the antenna inputs (AM and FM) for the tuner section; and the outputs for one or more pairs of speakers. In other words, the ins and outs of a tuner, pre-amp and power amp on a single back panel. In addition, the innards of receivers are very crowded and this makes repair more difficult. A receiver is as far as one should go in combining components. At least its tuner, pre-amp and power amp are all signal processing and amplification electronic circuits, without moving parts. Interference from electric motors is why compact music systems, which combine a receiver with program sources using a drive motor, such as a CD player, turntable or tape deck, are eschewed by audiophiles. Motors produce strong electro/magnetic fields that can cause problems when combined on a single chassis with sensitive electronics. An integrated amplifier and separate tuner are usually considered (at least potentially) superior to a receiver. An integrated amplifier gets the tuner into a separate chassis and away from the combined pre-amp and power amp, which is a step in the right direction. Better yet is to combine the pre-amp and tuner functions on a common chassis and use a separate power amp. The logic here is the tuner and pre-amp are both handling low-level signals and are therefore less likely to interfere with each other. Altec-Lansing, Marantz and McIntosh once offered excellent tuner/pre-amps and several component manufacturers still do. However, the combined tuner/pre-amp has never really caught on. Separate components (tuner, pre-amp and power amp) minimize the chance of cross-component interference. Separates also allow the most flexibility, since each can be purchased to match the buyer's particular needs and preferences and they do not even need to be the same brand. When a unit needs service or repair, only that component need be removed from the system. Likewise, any single component can be replaced or upgraded without changing the others. Finally, partly because they are more expensive, separate components usually offer the highest level of performance. Marantz SR4023 receiver. Illustration courtesy of D&M Holdings, Inc. This instrument is well made and it includes main-in/pre-out jacks to allow active bi-amplification of loudspeakers in conjunction with a separate stereo power amplifier. It also includes a pre-amplifier for moving magnet phono cartridges that allows direct connection of a turntable, a feature lacking in many receivers these digital days. It weighs about 20 pounds. As you can see, these are good specs, although not quite up to Marantz Reference Series standards for separate amplifiers. It would be unrealistic to expect a $500 receiver to perform as well as a $2500 integrated amplifier. However, the late Julian Hirsch, audio engineer, pioneer of scientific component testing and long time writer for Stereo Review magazine, once stated flatly that he could not hear the difference between a modestly priced Pioneer receiver and a pair of mega buck pre-amp/power amp separates. This, predictably, sent the nuttier audiophiles into convulsions and gallons of ink were wasted in fringe audio-fool publications to ridicule Mr. Hirsch's assertion. (I don't remember much objective testing, though.) My opinion is that it would take a very keen ear, indeed, to discern the difference if a receiver and separates of equal quality and output power were driving the same loudspeakers.